The Feline Environmental Enrichment Design Company introduces The NoBowl Feeding System. This revolution in the way we feed cats replaces the bowl with the hunt. "Cat owners agree. The NoBowl Feeding System was fully funded on Kickstarter in just 4 days." Introducing: The NOBOWL FEEDING SYSTEM. Inspired by nature. Based in science. Loved by cats. Could The NoBowl Feeding System be the Solution to What’s Ailing our Beloved Indoor Cats? F.E.E.D. Co., the Feline Environmental Enrichment Design Company, is proud to announce the launch of a revolutionary, veterinarian-designed product for indoor cats. Introducing: The NoBowl Feeding System, a new invention that replaces the bowl with the hunt, allowing a cat to stalk, trap and play with its food the way nature intended. This commonsense solution relies on a cat’s natural instincts to support overall feline mental and physical wellness. Clean, safe and easy to use, the NoBowl Feeding System dispenses the dry food cats love in a way that triggers the inborn feline cycle of hunting, playing with prey, eating, grooming and sleeping. The NoBowl Feeding System reawakens cats' natural instincts helping them become what they always wanted to be—a happy, healthy hunter. Cat owners agree. The NoBowl Feeding System was fully funded on Kickstarter in just four days. The idea for the NoBowl Feeding System belongs to practicing veterinarian Liz Bales, VMD. A lifelong cat lover, Dr. Bales is a devoted proponent of feline environmental enrichment, the study of the needs and well-being of indoor cats. All cats are hardwired to hunt. Hunting is a basic instinct essential to feline health. Yet, responsible cat companions know: Cats should remain indoors, both for their own safety and to protect outdoor animals. What cat lovers might not understand is that myriad kitty maladies, including commonplace feline diseases and behavioral issues, are linked to cat’s inability to hunt. It is important to understand that how you feed your cat is as important as what you feed your cat. The NoBowl Feeding System aims to transform cats back into hunters—happy hunters, that is. Chew on and claw at things she shouldn’t? The NoBowl Feeding System promises to get cats back to their happy, healthy, hunting selves. Here’s how the system works: Instead of gorging from a bowl, cats hunt to find small meals, plays to dispense their favorite dry food, and then rests to digest. After resting, cats will get hungry and will want to hunt again. Each NoBowl Feeding System includes a portion filler, a training NoBowl, five Naked NoBowls and five adorable, soft, cat-appealing mouse-shaped skins to cover the Naked NoBowls. To cats, NoBowls, with their contrasting colors, soft exteriors and tails, look like prey. The Naked NoBowls are designed to mimic the body of prey. The oval shape rolls in a predictable way that cats associate with the hunt. The NoBowl Skins are created to simulate the tactile feel of prey, allowing cats to grab, claw and use teeth as they would in the hunt. Every day, owners fill each of the five NoBowls with one fifth of the daily dry food ration, hide them near their cat's favorite hangouts, and let the cat hunt for food. When the cat discovers and moves the lightweight NoBowl, small holes on each NoBowl dispense the food and the cat eats. The body of each NoBowl, called the Naked NoBowl, is plastic and easily cleaned with soap and water, or washed on the top shelf of your dishwasher. The fabric Skin on each NoBowl is machine washable, and will quickly air dry. Dr. Bales and her team at F.E.E.D. Co. are dedicated to making the NoBowl Feeding System work for every cat, even cats who are slow learners. Their website, NoBowlCat.com (http://www.NoBowlCat.com), offers tutorials on how to use the product, and answers both frequently asked and asked-by-you questions about cats' needs. 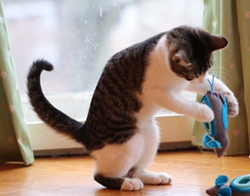 Dr. Bales blogs as TheCatvocate (http://www.TheCatvocate.com) offering up the latest in feline wellness, health news, and, naturally, about-to-go-viral cat videos. The NoBowl Feeding System will launch a Kickstarter campaign for supporters and early adopters March 10, 2016. The product will become available to the public in August, 2016. For more information, please contact us. We’d love to hear from you. Say goodbye to your old cat bowl. Say hello to NoBowl. F.E.E.D. Co., Feline Environmental Enrichment Design Company, is devoted to improving the lives and experiences of indoor cats. 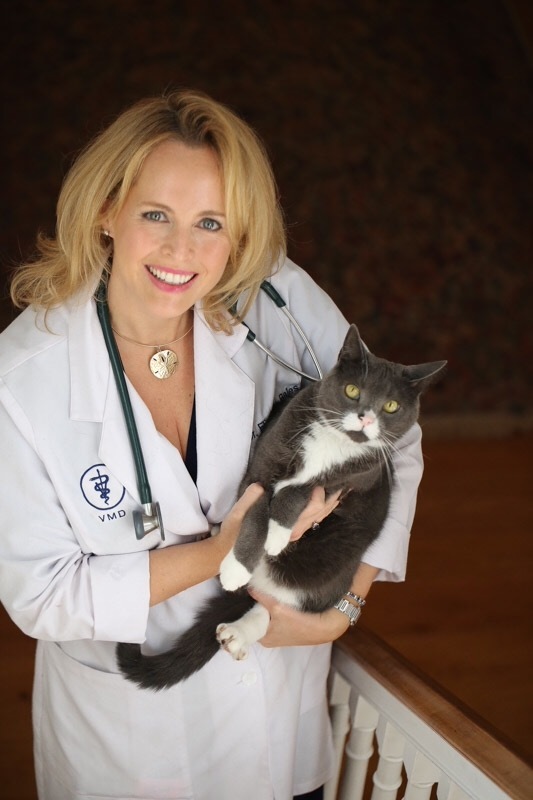 Founded by in 2014 by Liz Bales, VMD, the Philadelphia-based feline supply company uses cutting-edge veterinary research to create evidence-based products that fulfill the natural, instinctive needs of cats. F.E.E.D. Co.’s first innovative product, the NoBowl Feeding System, nourishes cats’ inner hunting instincts while healthfully dispensing nutritionally appropriate amounts of dry food. At F.E.E.D. Co., we make cats happy, instinctively.